US Marine Colonel Francis Fenton conducting the funeral of his son Private First Class Mike Fenton, near Shuri, Okinawa, May 1945. This picture depicts one of the most heart wrenching moments to occur on Okinawa involved a family with a proud Marine heritage. Colonel (later Brigadier General) Francis I. Fenton enlisted in the Marine Corps in August 1917. He gradually rose through the ranks until he became division engineer officer of the 1st Marine Division in July 1944. With this unit, Fenton won a Bronze Star for duty at Peleliu before landing on Okinawa. While Colonel Fenton advanced to higher command, his younger son, Michael, enlisted in the Marine Corps on August 17, 1943, and joined B Company, 1st Battalion, 5th Marine Regiment, 1st Marine Division – the same division in which his father commanded the engineers. Reportedly turning down a commission so he could fight at the front, Michael served as a scout-sniper (on) Okinawa. They would never talk again. On May 7, 1945, while beating back a Japanese counterattack not far from Sugar Loaf, 19-year-old Pfc. Michael Fenton was killed. 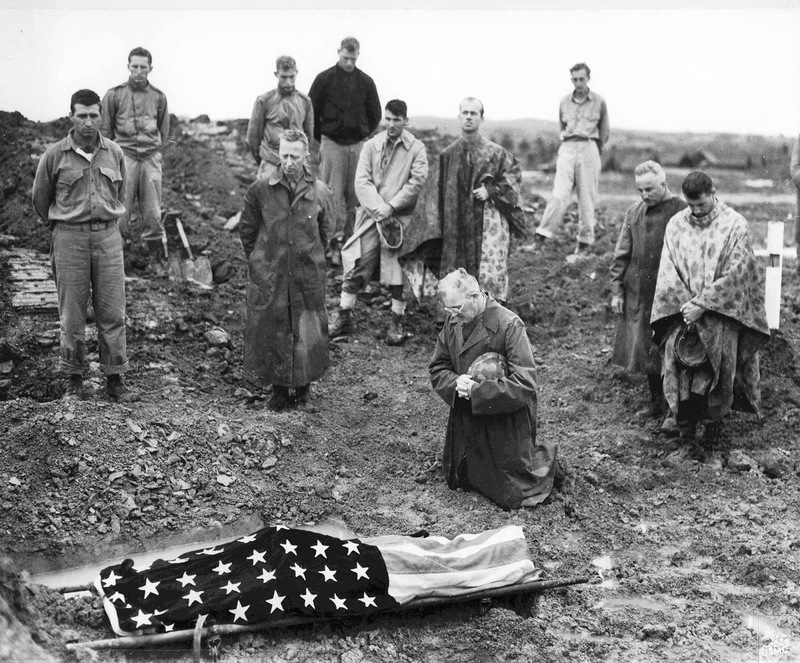 When his father received the bitter news, he traveled to the site of his son’s death and knelt down to pray over the flagdraped body, a scene that produced one of the Pacific war’s most touching photographs. Upon arising, Colonel Fenton stared at the bodies of other Marine dead and said: ‘Those poor souls. They didn’t have their fathers here’.